January can be cold and dark in Aspen, and so it was when I said goodbye to my gallery for the last time 7 years ago. I had been there 19 years, I knew I would miss it, the wonderful collectors, meeting new people, helping them find art they would love. Simply put, it was time. But in a quiet way, I knew I would be back, some day in a different experience. I can never do the same thing twice, I’m just built that way. So when artist, Nancy Noel contacted me in early August about running her new gallery, I had mixed feelings, not realizing I was ready to come back to directing a gallery. I knew she needed a director, I had been contact by no fewer than three different acquaintances to this fact. And apparently, several people had given her my name as well. I wasn’t really thinking of running a gallery again, not really. But life does present surprises and I do love surprises. Nancy and I met on the Saturday before the Monday she was planning to return to her home in Indiana. I met with her mostly out of curiosity. Nancy and her two sons sort of interviewed me. I say sort of, because I was never asked for a resume or anything like that. We just spoke about her new gallery and what I might suggest. The more we spoke, the more intrigued I became. It was clear the gallery needed a director and the director need a gallery. We met again on Sunday evening; I suspect both of us had already decided what we would do. And I started the next day. In every way this was going to be a different gallery experience. N.A. Noel Gallery carries only Nancy’s work. This is new for me. There are many successful one person galleries in the world, but it requires a different approach. I’m used to presenting various one-person exhibitions and finding new artists and promoting their art and career. Nancy’s career is well established. She also paints from a unique vantage point, driven only by her spiritual guides. Nancy might paint an angel one day, and an Amish girl the next, or an enormous clock laden with crows the next. Each has a rich story to tell. Nancy’s skill with a brush is unquestionable and you can feel the emotional passion behind each stroke. This is the work of an artist driven to express what is welling up in her soul. Throughout her career she has drawn spectacular collectors to her work, people like Oprah Winfrey, Robert Redford and Nelson Mandela. But more importantly, her work is passionate. In the short time I’ve been running the gallery, I’ve seen viewers become overwhelmed with emotion, some crying, others expressing long buried stories about loved ones. She calls her gallery in Indiana a sanctuary. I think that’s the right word here too. Nancy’s work draws out those deeply buried feeling locked inside each of us. I was also intrigued by Nancy’s personal story. She is modest and it takes some tugging, but eventually some of her story came out. She is passionate about her work with children, animals and the planet. And she does something about it. 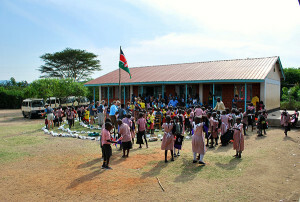 Nancy has built a preschool in Kenya, helping hundreds of children learn and get basic health care. It is a great success story, which touched me deeply and helped me make my decision to work with someone this compassionate. 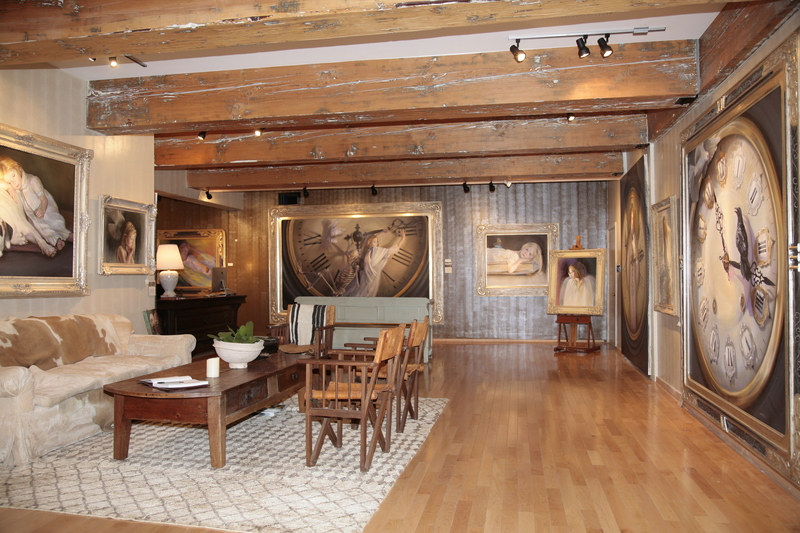 Everything about the Aspen gallery is unique, the art, the artist, the collectors, the way we present the work, the way viewers approach the art. All of it is different. I love to learn and I love the expansive experience it offers. 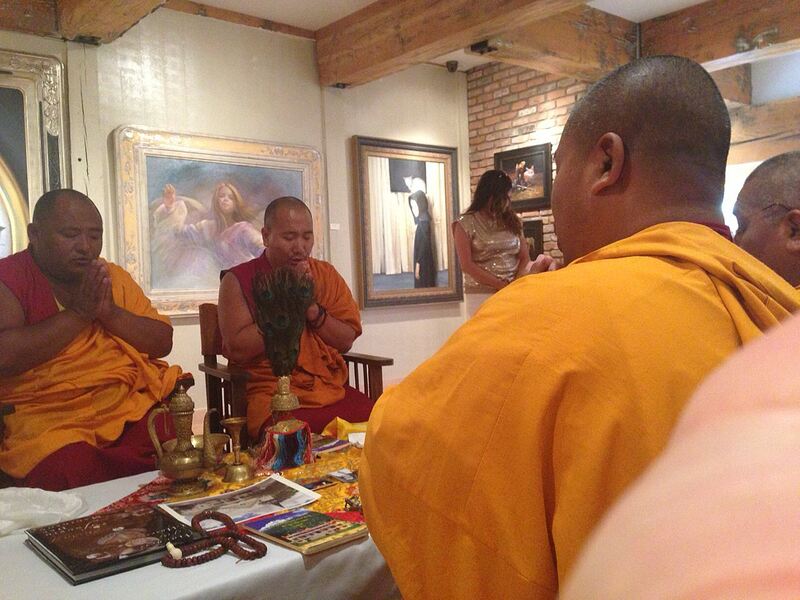 For example, last week we invited the Tibetan Monks of Gadan Shartse to do a blessing ceremony in the gallery. After an hour of chanting and prayer, the room glowed with spiritual light. Not exactly your typical art gallery, right? Good, because I don’t want ordinary, I want extraordinary. When you are visiting Aspen, please stop in and say hello. I’m glad to be directing again and honored to be presenting art that touches people’s souls in a magnificent gallery.